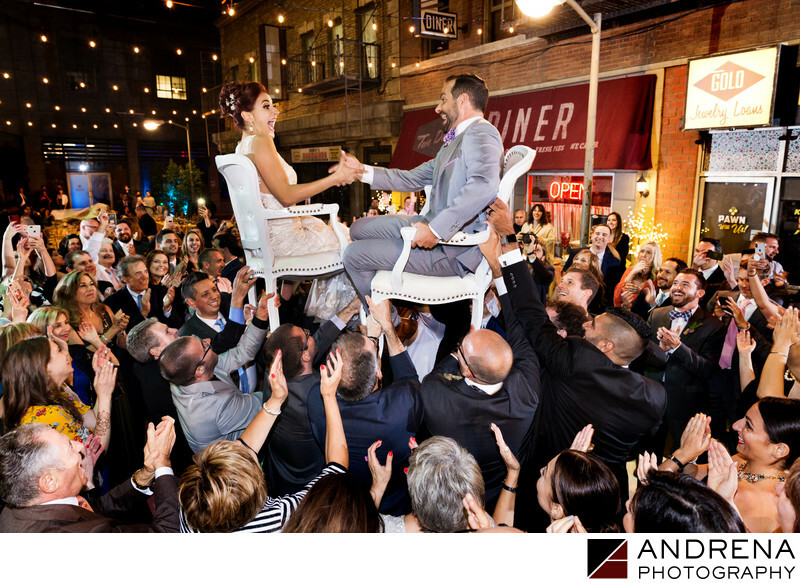 This amazing Jewish wedding took place on a hot and sunny day at the CBS Backlot in Los Angeles, proving to be a dream for our team of photographers as the backlot enabled us to capture a chair-hoisting on an actual New York Street! This fun outdoor location enabled us to take portraits in front of various studio exteriors as well as on streets designed to look like other areas. The ceremony itself took place in front of the actual house used for Leave it to Beaver, which added a sense of both whimsy and nostalgia to this gorgeous wedding. The reception took place under the stars, with long tables elegantly arranged on New York Street amidst storefronts galore. Laughter was the order of the day as this amazing couple never stopped smiling. Location: CBS Backlot, Los Angeles, California. Keywords: CBS Backlot (3), jewish wedding (6), Photographer (6).